My library has used Omeka as part of our suite of platforms for creating digital collections and exhibits for many years now. It’s easy to administer and use, and many of our students, particularly in history or digital humanities, learn how to create exhibits with it in class or have experience with it from other institutions, which makes it a good solution for student projects. This creates challenges, however, since it’s been difficult to have multiple sites or distributed administration. A common scenario is that we have a volunteer student, often in history, working on a digital exhibit as part of a practicum, and we want the donor to review the exhibit before it goes live. We had to create administrative accounts for both the student and the donor, which required a lot of explanations about how to get in to just the one part of the system they were supposed to be in (it’s possible to create a special account to view collections that aren’t public, but not exhibits). Even though the admin accounts can’t do everything (there’s a super admin level for that), it’s a bit alarming to hand out administrative accounts to people I barely know. This problem goes away with Omeka S, which is the new and completely rebuilt Omeka. It supports having multiple sites (which is the new name for exhibits) and distributed administration by site. Along with this, there are sophisticated metadata templates that you can assign to sites or users, which takes away the need for lots of documentation on what metadata to use for which item type. When I showed a member of my library’s technical services department the metadata templates in Omeka S, she gasped with excitement. This should indicate that, at least for those of us working on the back end, this is a fun system to use. I have included some screenshots below, but you might want to use the Omeka S Sandbox to follow along. 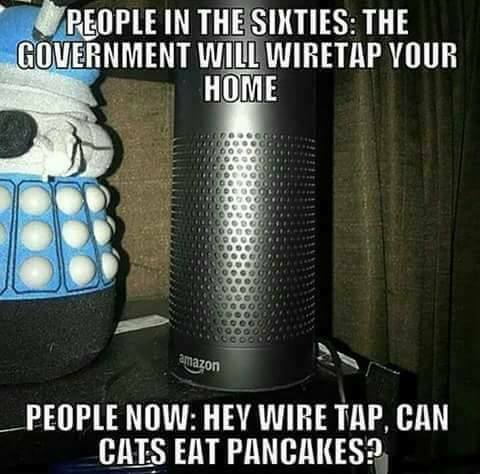 You can experiment with anything, and the data is reset every Monday, Wednesday, Friday, and Sunday. This includes a variety of sample exhibits, one is “A Battered Tin Dispatch Box” from which I include some screenshots below. This is what the Omeka Classic administrative dashboard looks like for a super administrator. And this is the dashboard for Omeka S. It’s not all that different functionally, but definitely a different aesthetic experience. Most things in Omeka S work analogously to classic Omeka, but some things have been renamed or moved around. The documentation walks through everything in order, so it’s a great place to start learning. Overall, my feeling about Omeka S is that it’s much easier to tap into the powerful features with less of a learning curve. I first learned Omeka S at the DLF Forum conference in fall 2017 directly from Patrick Murray-John, the Omeka Development Team Manager, and some of what is below is from his description. Omeka S has the very useful concept of Sites, which again function like exhibits in classic Omeka. Each site has its own set of administrative functions and user permissions, which allow for viewer, editor, or admin by site. 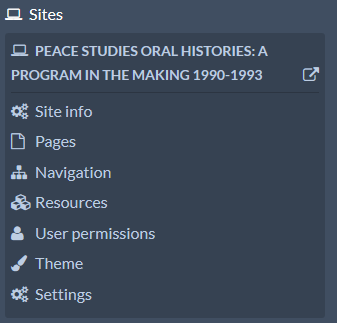 I really appreciate this, since it allowed me to give student volunteers access to just the site they needed, and when we need to give other people access to view the site before it’s published we can do that. It’s easier to add outside or supplementary materials to the exhibit navigation. On the individual pages there are a variety of blocks available, and the layout is easier for people without a lot of HTML skills to set up. These existed in Omeka Classic, but were less straightforward. Now you can set a resource template with properties from multiple vocabularies and build the documentation right into the template. The data type can be text or URI, or draw from vocabularies with autosuggest. For example, you can set the Rights field to draw from Rights Statement options. Items work in a similar fashion to Omeka Classic. Items exist at the installation level, so can be reused across multiple sites. What’s great is that the nature of an item can be much more flexible. They can include URIs, maps, and multiple types of media such as a URL, HTML, IIIF image, oEmbed, or YouTube. This reflects the actual way that we were using Omeka Classic, but without the technical overhead to make it all work. This will make it easier for more people to create much more interactive and web-integrated exhibits. Item Sets are the new name given to Collections and, like Items, they can have metadata from multiple vocabularies. Item Sets are analogous to Collections, but items can be in multiple Item Sets to be associated with sites to limit what people see. The tools for batch adding and editing are similar, but more powerful because you can actually remove or edit metadata in bulk. Themes in Omeka S have changed quite a bit, and as Murray-John explained, it is more complicated to do theming than in the past. Rather than call to local functions, Omeka S uses patterns from Zend Framework 3, and so the process of theming will require more careful thought and planning. That said, the base themes provided are a great base, and thanks to the multiple options for layouts in sites, it’s less critical to be able to create custom themes for certain exhibits. I wrote about how to create themes in Omeka in 2013, and while some of that still holds true, you would want to consult the updated documentation to see how to do this in Omeka S.
One of my favorite things in Omeka S is the Mapping module, which allows you to add geolocation metadata to items, and create a map on site pages. Here’s an example from the Omeka S Sandbox with locations related to Scotland Yard mapped for an item in the Battered Tin Dispatch Box exhibit. This can then turn into an interactive map on the front end. For the vast majority of mapping projects that our students want to do, this works in a very straightforward manner. Neatline is a plugin for Omeka Classic that allows much more sophisticated mapping and timelines–while it should be ported over to Omeka S, it currently is not listed as a module. In my experience, however, Neatline is more powerful than what many people are trying to do, and that added complexity can be a challenge. So I think the Mapping module looks like a great compromise. Migration between Omeka Classic and Omeka S works well for items. For that, there’s the Omeka2 Importer module. Because exhibits work differently, they would have to be recreated. Omeka.net, the hosted version of Omeka, will stay on Omeka Classic for the foreseeable future, so there’s no concern that it will stop being supported any time soon, according to Patrick Murray-John. We are still working on setting up Omeka S. My personal approach is that as new ideas for exhibits come up we will start them first in Omeka S. As we have time and interest, we may start to migrate older exhibits if they need continual management. Because some of our older exhibits rely on Omeka Classic pla but are planning to mostly create new exhibits in there that don’t rely on Omeka Classic plugins. I am excited to pair this with our other digital collection platforms to build exhibits that use content across our platforms and extend into the wider web. Because many libraries are working on similar projects, I wanted to describe our process and the lessons learned. While ultimately I am pleased with what we produced, I had to restrict the scope due to time and interest from the group, and there are some important takeaways from that. When we started the project, construction in the library and changes in staffing were disrupting normal functions. We knew it was important to restrict the project to the time necessary to complete finite deliverables. 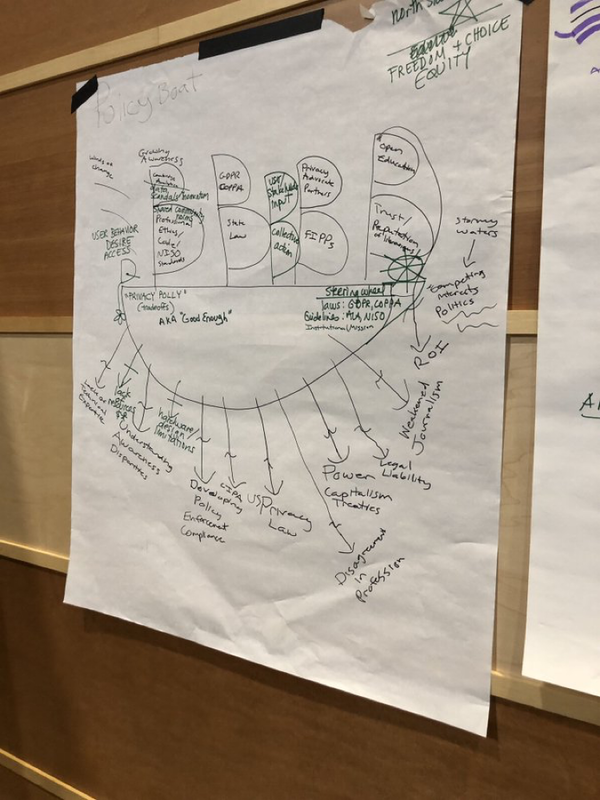 Rather than creating a new committee, we felt it would be helpful focus effort on learning about privacy, and bringing that knowledge back to departments and standing committees as an embedded value. We had a member from every department across the libraries (which ended up being ten people) and intentionally included a mix of department heads, librarians, and paraprofessional staff. Varying perspectives across departments and functions helped create good discussions and ensured that we would be less likely to miss something important. Nevertheless, such a large group can be unwieldy, and adding yet another set of meetings can be a challenge for already overburdened schedules. For that reason, my co-chair and I spent a lot of time preplanning all the meetings and creating a specific project plan that would be flexible to adapt to our needs, which we needed to do in the end. Our plan had our work starting in early August and ending in December with the goal to have: 1) a complete policy, 2) internal best practices documentation, and 3) an outreach plan. As it turned out, we did not complete all the internal documentation, but the policy and outreach plan were complete on time, and the policy went out to the public at the same time as when we reported on the work of the committee to all library staff in mid-January 2018. One of the most useful aspects of our project was treating it as a professional development opportunity with a number of reading assignments to complete before the kickoff meeting and throughout the work period (I have included some of the resources we used below). We also ensured from time to time we returned to theoretical, or guiding, principles of our work when it felt like we were feeling too bogged down with minutia. 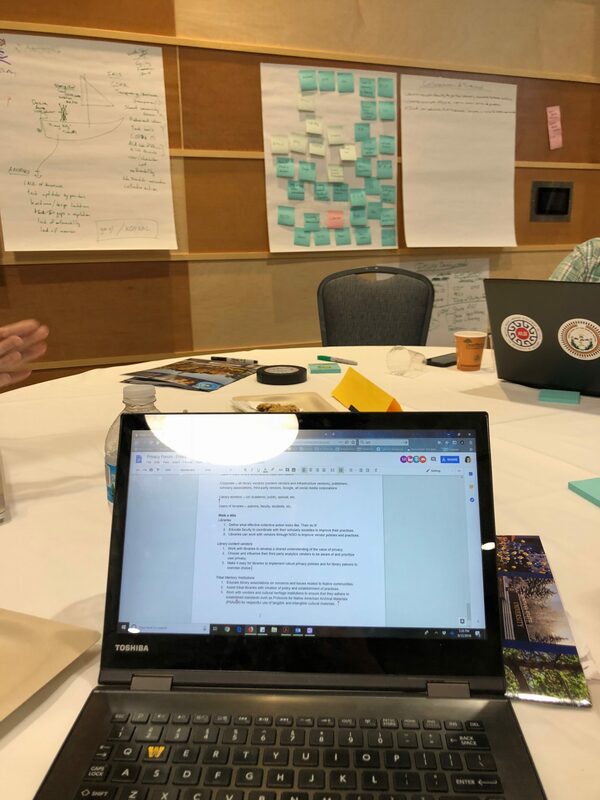 The plan ended up starting with research, followed by reading, writing, and practical research, more theory, and a final push with completing the draft of the policy and working on documentation. After spending some time talking through the project and figuring out some mechanics, we moved into the privacy audit stage. This requires examining every system and practice the library uses in a systematic manner and determining whether this falls in line with best practices. The ALA Privacy Checklists help with the latter part, but we also relied on Karen Coyle’s Library Privacy Audit spreadsheets. The first step was to brainstorm all the systems we used in our daily work and how we used them, and then divide those up by department. We mapped the systems we used into the spreadsheets, with some additional systems added. For that reason, multiple departments who use the same system in different ways reviewed some systems, and other systems that were unique to a department were reviewed just by that one. We then used the checklists to verify that we had covered the essentials in our audits and to raise additional issues that the spreadsheets did not cover. This was not always the most straightforward process for people unused to looking carefully at systems, but for that reason it was a useful process. By dividing the work up between departments, it meant that everyone in the library had a better chance to learn about how their work affected patron privacy and ask questions about the processes of other departments as patron information moves across the library. For example, when a patron requests that the library purchase a book, this is recorded in one system and leaves a trail through email as it goes between systems. After the request is placed, that information stays in various systems to ensure the patron gets the book after it arrives. As public and technical services talked through that process, it was easier to identify which pieces of it were important to good service and which created informational residue. Compiling the audit results into a useful format was a challenge, and this is an area of this project that did not meet my initial hopes. My original plan was to create a flexible best practices manual that would record all the results of the audit and how closely they met the standards set by the checklists. In practice, that was way too complicated, and we ended up just focusing on the “Priority 1” actions, which are those that any library can meet no matter their technical abilities. In fact, many of our practices are much better than that, but breaking the work down into smaller steps was a much more feasible approach. Ultimately, the co-chairs took the research done by all the task force members and created a list of practices for each checklist that indicated where we met best practices and where we needed to do more work. We asked all departments to complete the project identified for each checklist by one year out, and to consider including “Priority 2” level projects in departmental goals for the following fiscal year. After writing the rough draft, I listed all the sections where I was missing important information, and relied on the task force to fill in those sections. This was a fascinating process as we tried to explain technical processes that each of us understood in a way the whole group could understand and explain to a patron. Explaining the way the scanners could accidentally store a patron’s email address was an example of something that took multiple attempts to get right in the policy. The difficulty I had in writing was useful in itself, however. Each time I felt embarrassed or confused about describing one of our practices told me that this practice needed to change. I hope when we go back to revise the policy, the difficult sections will be easier to write because the practices will be better. One of the important privacy tasks in the checklists is the need for education and outreach to staff and patrons. The process of writing the policy in the task force took care of a lot of staff education, but this will need to be an ongoing process. For that reason, we recommended that the task force reconvene to check on the progress of privacy improvements in 9-10 months after the adoption of the policy, but not necessarily with the exact same members. As we work through fixing our practices this will be a great opportunity to have additional conversations with library staff and include more detail. No matter how many checklists or guidelines we consult, we will not be able to cover all scenarios. For that reason, we asked people to keep the following guiding principles in mind when making decisions about data collection that could affect patron privacy. Is it necessary to collect this information? Could I tell who an individual was even if there was no name attached? If I need to collect this information, what is the data I can remove to obscure personal information? To tell patrons about the policy we wrote a blog post and posted it on the library website. Obviously, this will not reach everyone, but at least will catch our most active users–we know from usability testing that people do look at our blog post headlines! Meanwhile, a set of recommended outreach practices included creating guides for how to turn on privacy features in browsers especially for specific vendor platforms with potentially problematic practices, partnering with our campus IT department on information security awareness, and presenting on privacy issues in research and teaching at a faculty professional development event. As someone who enjoys writing policies and looking for ways to improve processes, this kind of project will always appeal to me. However, many members of the task force told me that it was a useful exercise to improve their own knowledge and keep up to date with how the privacy conversation has changed even in the last few years. Because this is such a constantly shifting topic, this will require active management to keep our policy accurate and our practices in line with changes in technology. The good news is that this was a grassroots effort that can be started up again with relatively little effort as long as someone cares to do so, which I suspect will now always be the case at my library. Net neutrality was discussed back in 2014 on this blog, with Margaret Heller’s post entitled “What Should Academic Librarians Know about Net Neutrality?” We recommend you start there for some background on the legal issues around net neutrality. It includes a fun trip into the physical spaces our content traverses through to get onto our screens. One of the conclusions of that post was that libraries need to work on ensuring that everyone has access to broadband networks to begin with, and that more varied access ensures that no company has a monopoly over internet service in a location. There have been a number of projects along these lines over the past decade and more, and we encourage you to find one in your area and get involved. Equal access to information starts with having access at all. Several libraries have kicked off initiatives in activities like loaning out wi-fi hotspots for several-month periods in New York City, Brooklyn, and Chicago. Ideally everyone will have secure and private internet access.The Library Freedom Project has been working for years to protect the privacy of patrons, including educating librarians about the threat of surveillance in modern digital technology, working with Tor Project to configure Tor exit relays in library systems, and creating educational resources for teaching patrons about privacy. These are some excellent steps towards a more democratic and equal access to information, but what happens if the internet as we know it fundamentally changes? Let’s explore some “alternative internets” that rely on municipal and/or grassroots solutions. You might be familiar with wireless mesh networks for home use. You can set up a wireless mesh network in your own house to ensure even coverage across the house. Since each node can cover a certain part of your house, you don’t have to rely on how close you are to the wireless router to connect. You can also change the network around easily as your needs change. Mesh networks are dynamically routed networks that exchange routes, internet, local networks, and neighbors. They can be wireless or wired. Mesh networks may not be purely a “mesh” but rather a combination of “mesh network” technology as well as “point to point” linking, with connections directly linking to each other, and each of these connections expanding out to their local mesh networks. BMX6/BMX7, BATMAN, and Babel are some of the most popular network protocols (with highly memorable names!) for achieving a broad mesh network, but there are many more. Just as you can install devices in your home, you can cooperate with others in your community or region to create your own network. The LibreMesh project is an example of a way in which DIY wireless networks are being created in several European countries. Outside of North America, Berlin has its own mesh networked, called Freifunk. Austria has Funkfeuer. Greece has the Athens Wireless Metropolitan Network. Italy has Ninux and Argentina has AlterMundi. Villages in rural northern England are joining together to get connected via a cooperative model called B4RN, where they dig their own trenches for cables using their farm tractors. Guifi.net is a wi-fi network that covers a large part of Spain and defines itself as “the biggest free, open and neutral network.” It was developed in 2004 as a response to the lack of broadband Internet, where commercial Internet providers weren’t providing a connection or a very poor one in rural areas of the Catalonia region. Guifi has established a Wireless Commons License as guidelines that can be adopted by other networks. At time of posting, 34,306 nodes were active, with over 17,000 planned. Finally, Brooklyn Public Library was granted $50,000 from IMLS to develop a mesh network and called BKLYN Link, along with a technology fellowship program for 18-24 year olds. Looking forward to what emerges from this initiative! The internet was started when college campuses connected to each other across first short geographic areas and eventually much longer distances. Could we see academic and public libraries working together and leading the return to old ways of accessing the internet for a new era? Meanwhile, it’s important to ensure that the FCC has appropriate regulatory powers over ISPs, otherwise we have no recourse if companies choose to prioritize packets. You should contact your legislators and make sure that the people at your campus who work with the government are sharing their perspectives as well. You can get some help with a letter to Congress from ALA. Libraries who use a flexible content management system such as Drupal or WordPress for their library website and/or resource discovery have a challenge in ensuring that their data is accessible to the rest of the library world. Whether making metadata useable by other libraries or portals such as DPLA, or harvesting content in a discovery layer, there are some additional steps libraries need to take to make this happen. While there are a number of ways to accomplish this, the most straightforward is to create an OAI-PMH feed. OAI-PMH stands for Open Archives Initiative Protocol for Metadata Harvesting, and is a well-supported and understood protocol in many metadata management systems. There’s a tutorial available to understand the details you might want to know, and the Open Archives Initiative has detailed documentation. Content management tools designed specifically for library and archives usage, such as LibGuides and Omeka, have a built in OAI-PMH feed, and generally all you need to do is find the base URL and plug it in. (For instance, here is what a LibGuides OAI feed looks like). In this post I’ll look at what options are available for Drupal and WordPress to create the feed and become a data provider. This is short, since there aren’t that many options. If you use WordPress for your library website you will have to experiment, as there is nothing well-supported. Lincoln University in New Zealand has created a script that converts a WordPress RSS feed to a minimal OAI feed. This requires editing a PHP file to include your RSS feed URL, and uploading to a server. I admit that I have been unsuccessful at testing this, but Lincoln University has a working example, and uses this to harvest their WordPress library website into Primo. If you use Drupal, you will need to first install a module called Views OAI-PMH. 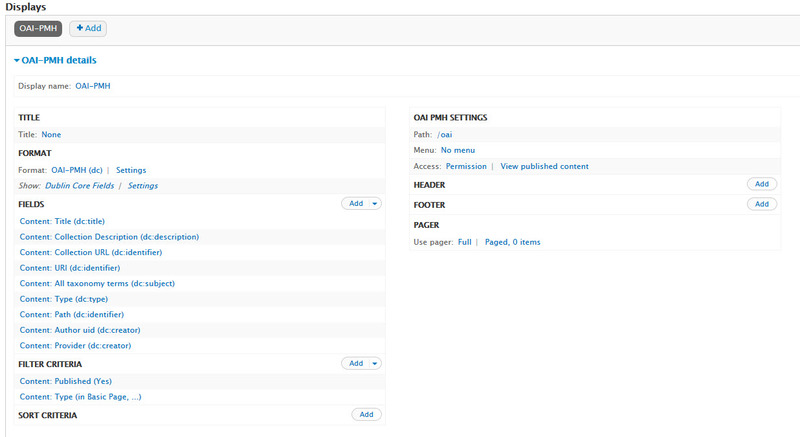 What this does is create a Drupal view formatted as an OAI-PMH data provider feed. Those familiar with Drupal know that you can use the Views module to present content in a variety of ways. For instance, you can include certain fields from certain content types in a list or chart that allows you to reuse content rather than recreating it. This is no different, only the formatting is an OAI-PMH compliant XML structure. Rather than placing the view in a Drupal page or block, you create a separate page. This page becomes your base URL to provide to others or reuse in whatever way you need. The Views OAI-PMH module isn’t the most obvious module to set up, so here are the basic steps you need to follow. First, enable and set permissions as usual. You will also want to refresh your caches (I had trouble until I did this). You’ll discover that unlike other modules the documentation and configuration is not in the interface, but in the README file, so you will need to open that out of the module directory to get the configuration instructions. To create your OAI-PMH view you have two choices. You can add it to a view that is already created, or create a new one. The module will create an example view called Biblio OAI-PMH (based on an earlier Biblio module used for creating bibliographic metadata). You can just edit this to create your OAI feed. Alternatively, if you have a view that already exists with all the data you want to include, you can add an OAI-PMH display as an additional display. You’ll have to create a path for your view that will make it accessible via a URL. The details screen for the OAI-PMH display. The Views OAI-PMH module only supports Dublin Core at this time. If you are using Drupal for bibliographic metadata of some kind, mapping the fields is a fairly straightforward process. However, choosing the Dublin Core mappings for data that is not bibliographic by nature requires some creativity and thought about where the data will end up. When I was setting this up I was trying to harvest most of the library website into our discovery layer, so I knew how the discovery layer parsed OAI DC and could choose fields accordingly. After adding fields to the view (just as you normally would in creating a view), you will need to select settings for the OAI view to select the Dublin Core element name for each content field. 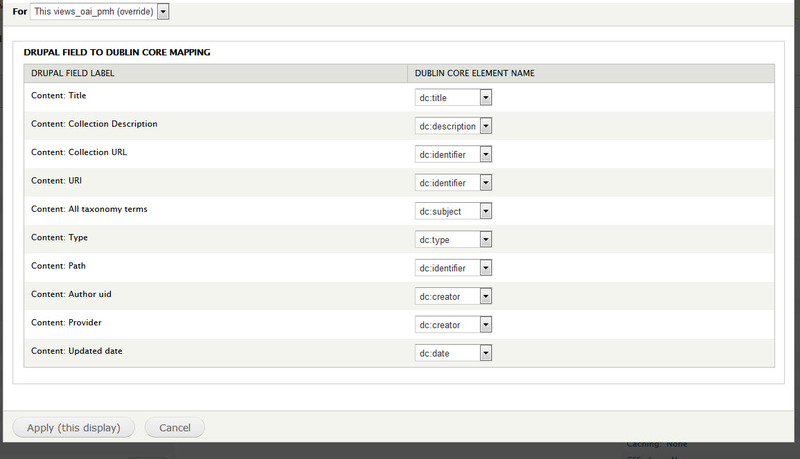 You can then map each element to the appropriate Dublin Core field. The example from my site includes some general metadata that appears on all content (such as Title), and some that only appears in specific content types. For instance, Collection Description only appears on digital collection content types. I did not choose to include the body content for any page on the site, since most of those pages contain a lot of scripts or other code that wasn’t useful to harvest into the discovery layer. Explanatory content such as the description of a digital collection or a database was more useful to display in the discovery layer, and exists only in special fields for those content types on my Drupal site, so we could pull those out and display those. Whereas databases get more information pulled in. Note that there are two identifiers, one for the database URL, and one for the database description link. We will make these both available, but may choose one to use only one in the discovery layer and hide the other one. When someone does a search in the discovery layer for something on the library website, the result shows the page right in the interface. We are still doing usability tests on this right now, but expect to move it into production soon. I’ve just touched on two content management systems, but there are many more out there. Do you create OAI-PMH feeds of your data? What do you do with them? Share your examples in the comments.